Why did I read this book: Ana and I are HUGE Brandon Sanderson fans – we loved his Mistborn books, The Way of Kings, and Warbreaker. Naturally, when I heard about this book, I couldn’t wait to get my hands on a copy. The son of a chalkmaker and cleaning woman at Armedius Academy, sixteen year old Joel has always yearned to be a Rithmatist. At the age of 8, every child undergoes a selection ceremony during which the Master selects a handful of those destined to be Rithmatists – that is, those with the power to bring chalk drawings to life. After his ceremony, Joel emerges as just another normal civilian…but he never gives up his dream and yearning for Rithmatics. The rare recipient of a scholarship to the prestigious Academy (thanks to his parents), Joel has grown up alongside the rich and powerful, civilians and the much-admired Rithmatists alike. Even though Joel isn’t allowed to enroll in Rithmatic classes, he sneaks his way into those forbidden classes, reads up on all the theory books he can get his hands on, and practices drawing his own Rithmatic lines of power (even though they are just chalk lines on the ground without any power of their own). When new, aggressive instructor Nalizar shows up at Armedius, he upsets the fragile balance of power in the faculty by embarrassing and displacing the experienced and tenured Professor Fitch from his Rithmatics students. Then, shortly after Nalizar’s dramatic arrival, promising young Rithmatic students start mysteriously disappearing overnight. At each of the scenes of the kidnappings, strange, unknown forms of markings are discovered – pointing not only to a Rithmatist as the perpetrator, but a powerful one that possesses sketches of power unbeknownst to all other Rithmatists and scholars. As ordinary and unmagical as Joel may be, he is also incredibly smart and observant – and it is up to Joel, Professor Fitch, and a strange, persistant young Rithmatist named Melody to figure out who is behind the kidnappings and how to stop them, before it is too late. 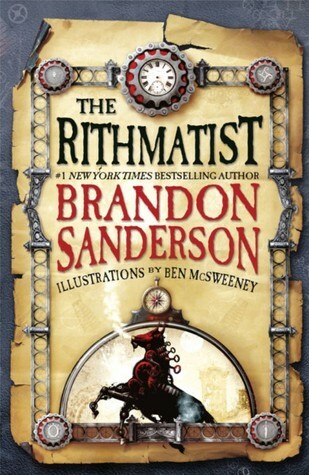 The first novel in a brand new series from much-lauded adult fantasy author Brandon Sanderson, The Rithmatist is an imaginative, action-packed SFF adventure – entertaining, fun, and with oodles of future potential. In other words: get your chalk out, folks, because this is another good one from Brandon Sanderson. True to form, The Rithmatist‘s greatest strength lies with its wonderfully unique magical system. I will never tire or cease to be impressed by Sanderson’s imaginative applications and rules of magic-making – in Mistborn, it was the idea of ingesting and “burning” metals; in The Rithmatist, it’s the ability to inbue life and power into simple chalk drawings. The idea of Rithmatics is fascinating, and simple: only certain people can impart this gift of life to chalk, and only certain types of lines, sigils, and commands are possible. 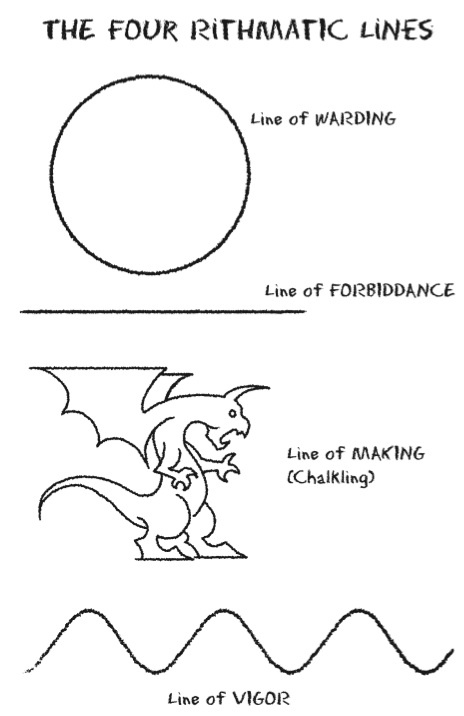 These include circular lines of warding (for protection of the Rithmatist, but only so strong as the circle is even), lines of forbiddance (that act like forcefields, but are weak at the edges), lines of vigor (which can only attack other chalk lines), and lines of making (or “chalkings” – creatures that advance and attack other chalk drawings, but also have the ability to also kill human subjects at will). It is these chalkings that are the problem for the inhabitants of this strange new world, as “wild chalkings” are an ever-present danger, always attacking and threatening the wards held up by Rithmatists at Nebrask. In return for their training and ten years of service defending the world from the unstoppable threat of wild chalkings, Rithmatists are given generous pay and luxury for the rest of their lives. While there are only four types of lines that are known and taught to all Rithmatists, the combinations and strategies one can use with those lines are endless. And Joel, our young protagonist, loves and studies all of these possibilities. There are defenses behind multiple lines of forbiddance and intricate nine-point circles; there are defenses that boldly abscond lines of forbiddance and rely on onslaughts of chalkings to take out enemies. And, once again true to form, Brandon Sanderson explores many of these applications and theories in the text, and through the wonderful illustrations by Ben McSweeny. The kicker, of course, is the idea that there could be many more lines that Rithmatists simply do not know of – and when the kidnappings start in this first book, the door opens to this new realm of magical possiblity. I love intricate magical systems, people, and Brandon Sanderson does this better than almost anyone. There are so many possibilities for the future direction of this magic as Joel and his friends discover new lines of power, different properties of chalk involved, and the very theory behind what gives a Rithmatist their power in the first place. 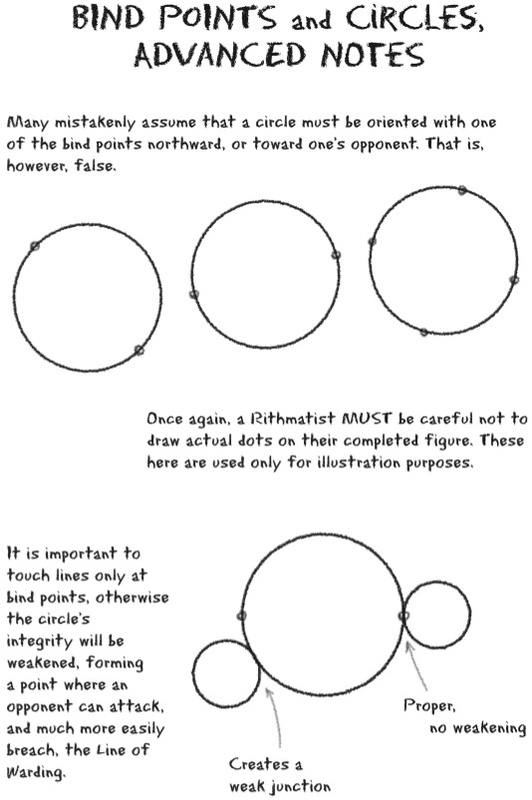 In this respect, The Rithmatist is freaking fantastic. But beyond magical systems and potential, this is a novel that depends on characters and storytelling – so how do those stack up? Pretty darn well. At roughly 400 pages, The Rithmatist is a tad shorter than the usual fantasy tome from Sanderson, but manages to both introduce this brave new world of chalk magic and solve the mystery of the missing students handily. From a character point of view, we are introduced to our main protagonist, Joel, as well as two major (if supporting cast) characters in the mild-mannered Professor Fitch (who isn’t defined much beyond his scatterbrained professor label), and the dramatic Melody. Joel is, at first, that annoying smartass guy – you know the type. The one who is effortlessly brilliant who gets perfect scores on his math and history exams, but doesn’t bother with the homework or paying attention because all he cares about is Rithmatics. That is, he’s that unlikable “I’m too smart to care about this” kind of guy – and he’s supposed to be the unlikeable slightly douchey guy, at first. As we learn about Joel and his passion for Rithmatics, and as Joel learns about the truth of his family’s past and why his mother works so hard, however, Joel becomes much more of a human, relatable character (especially as we see him start to change, to care, and to apply himself). In contrast to Joel, Melody is less developed but an interesting figure (at least in my mind) – she’s horrible at drawing lines and circles, but has unparalleled skill when it comes to drawing and controlling her chalkings. I love that Melody is not immensely powerful or gifted, and mostly that she is a girl who is unapologetic about her likes and dislikes, and one that likes to draw unicorns as her chalkings of choice. I wish that we could have spent more time with Melody and Joel, but hopefully in the next book – especially with the way The Rithmatist ends and how well Joel and Melody work together – we’ll see more of her as a developed and fully appreciated character. On the plotting and worldbuilding front, things are also competently handled (if not nearly as developed as other facets of the story). While there isn’t much in the way of TWISTS or shocking plot developments, I do like the way the story unfolds, especially in the way the book ends. There was one BIG point where The Rithmatist could have completely lost me, but thankfully, the book doesn’t go down that road (I sincerely hope it doesn’t in future installments, either). I don’t want to give too much away, but suffice it to say that I appreciate how Joel is special in that he has a keen mind with an attention to detail – but he’s not special, if you catch my drift. I love that he is not a Rithmatist, that he is just a very smart boy with a passion for understanding the theory behind Rithmatics and the skill to create strategies, even if he cannot make the lines come to life. And I’ll certainly be around for subsequent books – because ultimately, The Rithmatist is a solid, imaginative start to a new YA fantasy series. I absolutely cannot wait to return to Joel and Melody’s world, and absolutely recommend this book, especially for fans of complicated magical systems…and lovers of geometry. You can read the full excerpt (the first five chapters) online HERE. Additional Thoughts: Make sure to check out our interview with Brandon Sanderson about The Rithmatist HERE. Hmmm. I do love a unique magical system, too – can’t wait to pick this up! Glad to hear that it has so much potential. Awesome concept! I will definitely look for this book. Whoa !!! The book sounds amazing or is it the review? Brandon’s ‘Alcatraz’ series was good too. Unique magic system, great plot and lovly characters, this book is great. Have all of his books. Great concept! Finished it last night and loved it to the core. Gonna surely read this one! Recently finished The Final Empire and it was absolutely fantastic. Thanks for the wonderful post. Really Enjoyed it. Defo going to read this! Thanks!